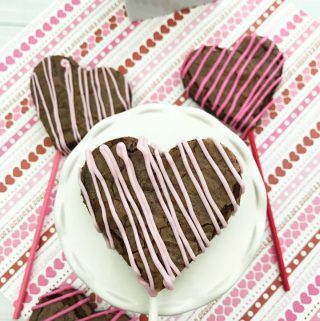 These Valentine brownies are heart shaped brownie cutouts on a stick with a candy drizzle. 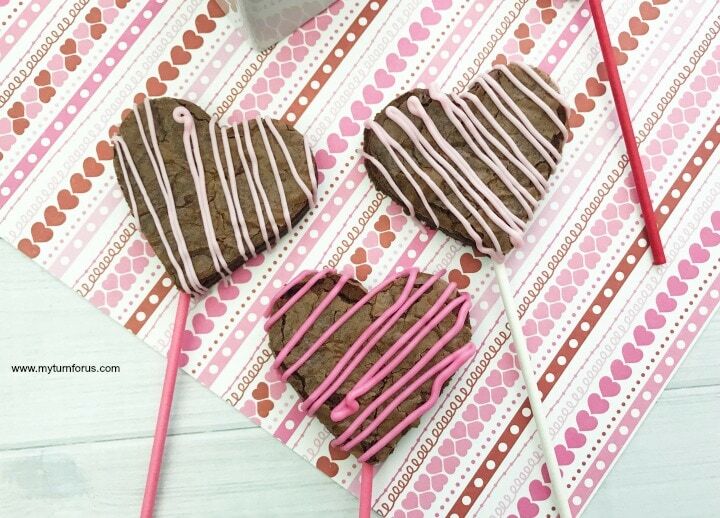 And these cute Heart Brownie Pops are so easy to make and would be fun to give as Valentines. We have copied a fun cake pop idea and made brownie pops. 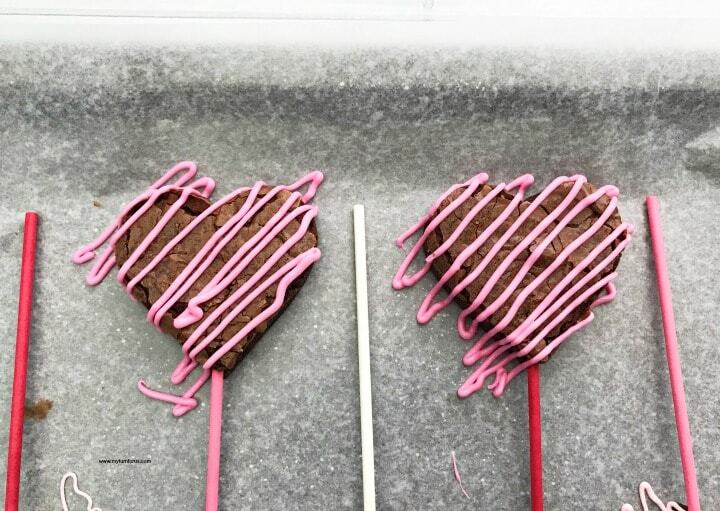 These heart brownie pops are easier than you would believe. 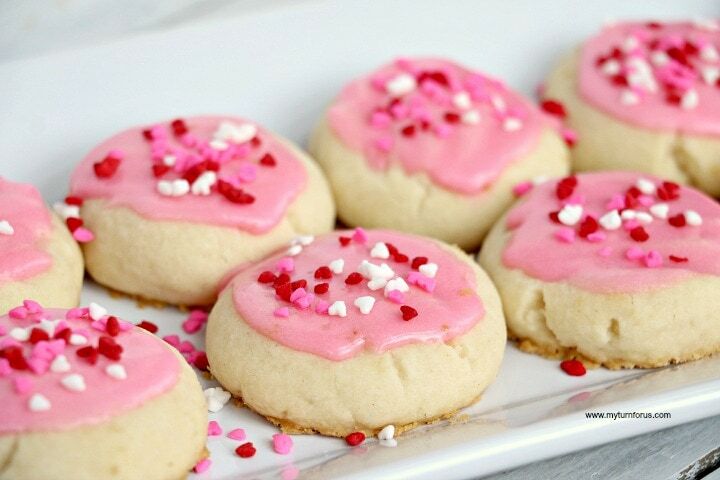 You don’t have to be a cake decorator to serve these easy homemade treats. You can easily make these brownie pops by using a store bought brownie mix. That’s right; there is nothing wrong with using a few shortcuts. But by going the extra step of adding these candy stripes to these brownie pops that makes them more festive. Mix the brownies according to the package directions but bake in a 13 X 9 pan. 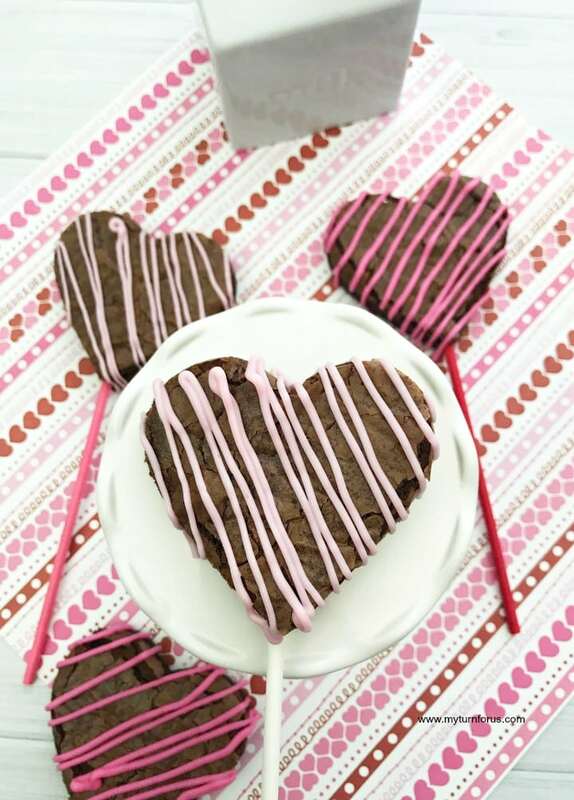 After allowing the brownies to cool completely, cut heart shaped brownie pops using this Valentine cutter. Then line a baking sheet with parchment paper. 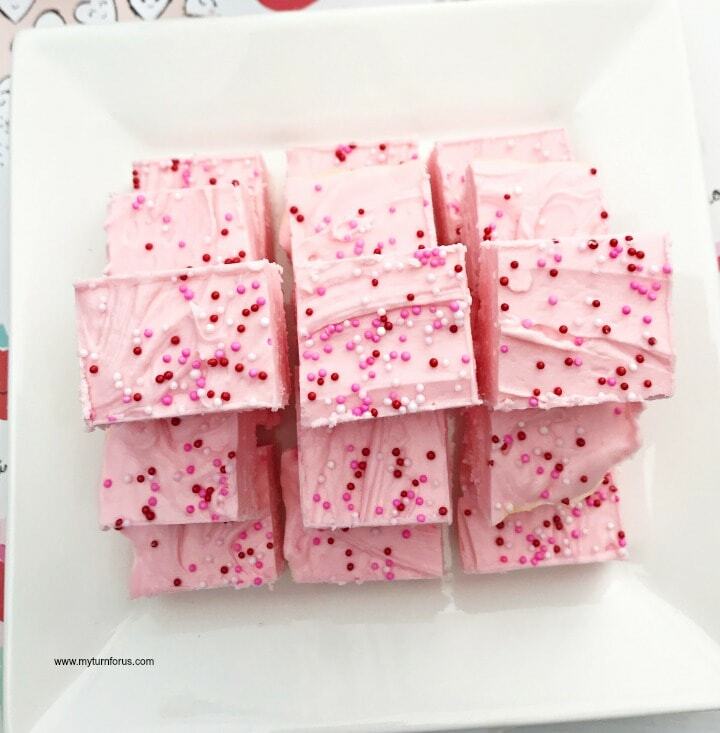 Pour 5 oz of light pink candy and 5 oz of darker pink ones into two microwave safe bowls. 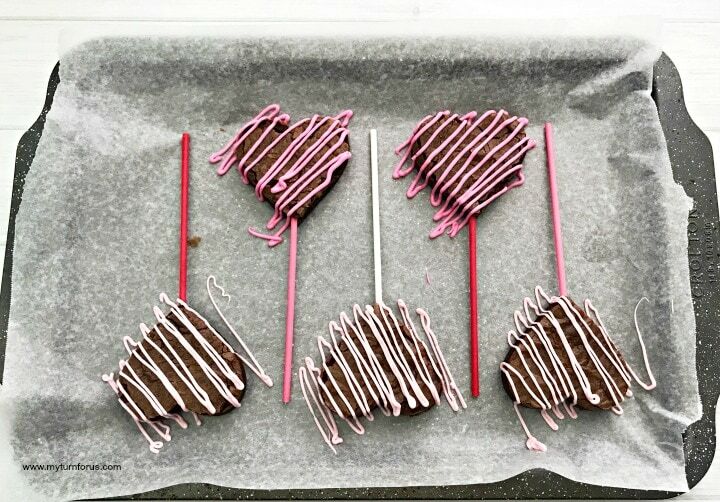 Place the brownie pops on the paper-lined tray and insert a lollipop stick into the bottom of each of them. Heat the melts separately in one bowl at a time in the microwave in 30-second increments stirring often until melted. Allow them to cool slightly then scoop each color into two different sandwich bags. Snip a small corner of the baggie and gently squeeze the melted candy onto each Valentine brownie pop in a zigzag pattern. Allow these brownie pops to cool completely. Repeat with all the brownie pops. These would be so cute if placed in cellophane baggies to give as gifts. Or served on tray Valentine’s Day parties for children and adults. 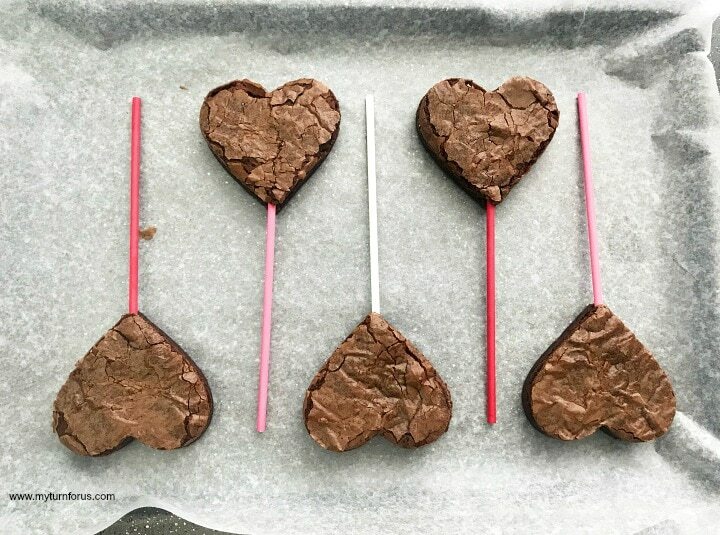 We hope you enjoyed these cute Valentine brownies. Combine the brownie mix, eggs, water, and oil. Pour the brownie batter into the prepared pan. Bake 25-30 minutes. Insert a toothpick around 30 minutes; if it comes out clean, the brownies are done. Remove the brownies from the oven and let cool completely. 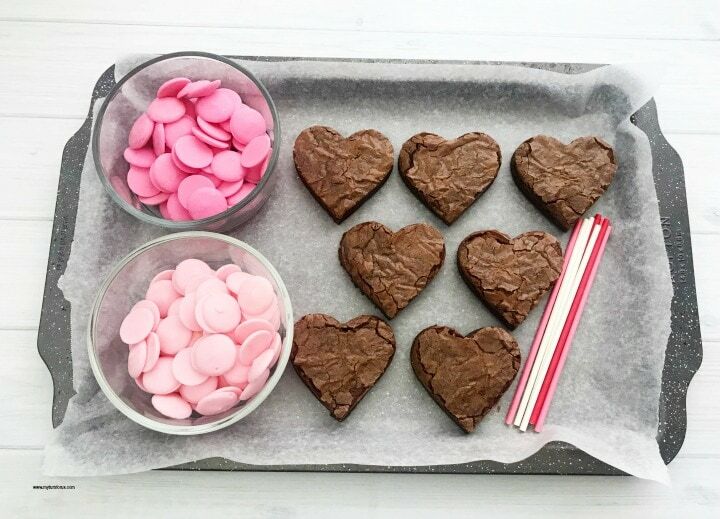 Use the heart-shaped cookie cutter to cut out the heart-shaped brownies. Gently insert a lollipop stick into the base of each brownie and place on the baking sheet. Pour 5 oz of each Wilton candy colors melts into separate microwave-safe bowls. Place each bowl in the microwave one at a time - heating for 30-second increments, stirring occasionally until melted. Let cool a few minutes. Scoop the melted chocolate into 1 sandwich baggy. Snip the corners of the baggies and gently squeeze the melted chocolate from each baggy onto the brownies in a zig-zag pattern.